This is remarkable. Imagine if the same was true in Sweden. Imagine if our most dangerous elements yielded to our crazy homeless people. Imagine a fresh-faced young Techno Viking yielding to Stellan Hagmalm. Our Data Analytics team plotted the results of my field observations in the following UNCW spectrum. 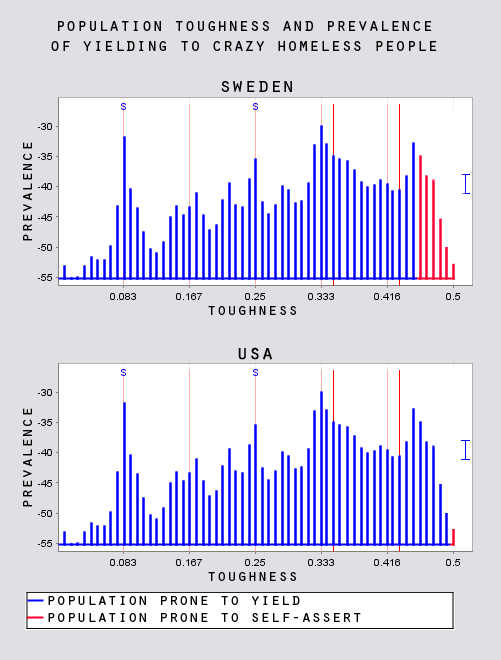 Please note that population toughness is constant, but yielding prevalence varies. This reflexive attitude vis-à-vis homeless old men in flannel bathrobes can plausibly indicate that America is suspended in a strict “Bellum Omnium Contra Omnes”, but we need more data before we can issue a formal report.